What’s the oldest item in your food cupboard? Now here’s a challenge for you this weekend. Find the oldest store cupboard item in your kitchen. Once you’ve done that, think about it very carefully. Would you still eat it? What if it was out of date by over 18 years? A recent investigation by the Daily Mail saw ageing food stuffs being sent to a lab for microbiological testing. 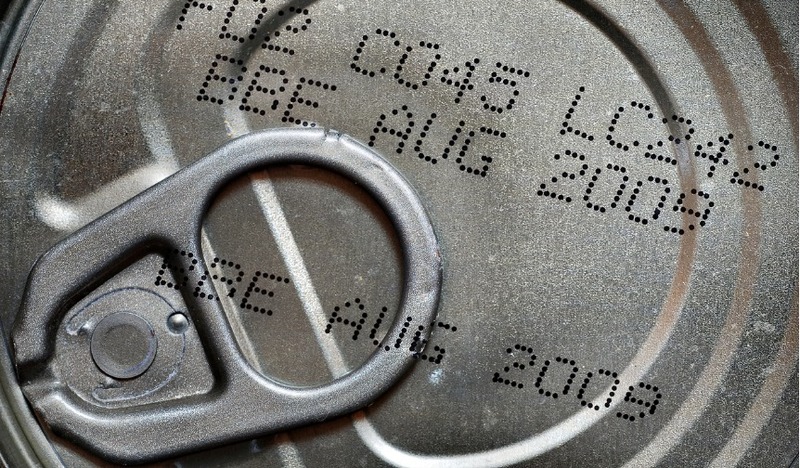 These included a 12-year-old can of tuna, an eight-year-old jar of gravy granules, a bottle of ale, which was 16 years out of date, and an opened pot of chilli powder, due to expire in 2000. Each was examined for a host of undesirables, including E.coli, salmonella, listeria and Clostridium perfringens, as well as for yeasts and moulds. A food technologist then examined the results and found that all of the groceries, bar the ale, were still perfectly edible. But would you risk it? Sometime on the cusp of the 1980s/1990s, I distinctly remember asking my nan if she had any ‘tomato sauce’ to go with the chips she’d served up for lunch. She told me to go and look for it in the larder. Rifling through rusting cans of soup, custard powder, mustard powder, Spam and corned beef, I finally located it at the back of the cupboard. It was in a slightly different shaped bottle and the price had a 1/2p attached to it. Suspicious that it might be past its shelf life, I looked for the Best Before date and gasped when I read: Dec 1979. ‘It’ll be alright – get it down ya, gal,’ my grandad tried to assure me. It definitely wasn’t. Turns out opened bottles of ketchup that have been in the cupboard for over 10 years go a very unappetising shade of reddy-brown with a separated yellow top. For the Best Before sticklers, I’d like to say I joined your ranks that day and have been a loyal soldier ever since. But as Which? Convo regulars will know, it isn’t true. I take after my grandparents and rarely pay attention to Best Before dates. Looking through my own food cupboard, I can actually beat my nan’s ketchup. A good number of items, such as bags of rice, pasta and lentils, should have been used up by the end of 2016. I’ve also got two bottles of Lea & Perrin’s and some mint sauce that expired in September 2013. Lurking at the back is a packet of cornflour that I bought when I first moved in, dated June 2006. I didn’t think I could beat this until I remembered the spice tin. Inside, I found a packet of ground cinnamon, which was apparently past its best in 2002! Would I still use them? Yes – and I have done, with no ill effects to date. And with more than 10 million tonnes of food being thrown away in Britain each year, almost half of which is deemed avoidable (as in, still edible), I’m not about to contribute to that figure any time soon. What about you? What’s the oldest item in your food cupboard? When I put in a new kitchen a year ago I had to clear out all my kitchen cupboards and found 2 tins of sardines. One was dated 1994 and the other was about 2005 I think. Being frugal I put aside the 1994 one to give to my neighbour for her cat and with some hesitation ate the other one for tea. The next day I looked for the “cat’s” tin to hand in to neighbour only to realise I’d actually eaten the 1994 tin by mistake! I’ve several pots of blackcurrant jam that my late wife made in 1999. I am on the 3rd one now and the jam is as good and tasty as the day she made it! Slightly diverging from my own collection of well out of date tins ,my big worry is beef or othere meats from the USA ,as farmers there can buy antibiotics over the counter in feed merchants and inject their animals to fatten them up !!!!!!!! More greed !!! , also USA people eat more GM modfyed food than any country in the world ,it’s in everything they eat ,look at the result the most over weight nation in the world . Now the international food company’s are conning us in Europe that it’s good for you/ us ,when clearly it’s killing the yanks .